I am an IT Technician and run a small independent business that offers computer repair Macclesfield. This article will help you decide if your computer requires attention from a professional. Is your computer being a complete pain in the neck? Has it suddenly slowed to a crawl and driving you mad or is it freezing and crashing (usually when you’re right in the middle of something important). You may have even experienced the BSOD or blue screen of death although this is seen less with newer operating systems such as Windows 7 & Windows 8. These symptoms are usually a good indication that there is a fault on your computer. All computers have a hard disk or drive which stores the operating system and your data. They are mainly mechanical with moving parts (Newer solid state disks use flash memory and have no moving parts) which means they can fail, and they often do. If you are fortunate the data on the disk can be retrieved by a computer technician. If the disk is completely unreadable your only other choice is a specialist data recovery company but the fees can run into the hundreds. The disk is dismantled in a clean environment and special equipment is used to read the platters from inside the disk. 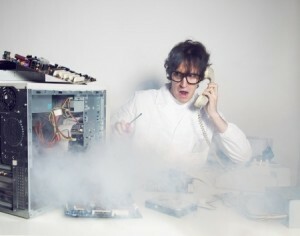 Failure of the computer power supply unit is one of the most often seen problems. The user presses the power button and nothing happens and confusion ensues. Replacement of a PSU or power supply unit is a relatively simple and inexpensive repair for a technician and can usually be done on the same day. The CPU or processor gets extremely hot when running and requires a heat sink with a fan attached to cool it. It will still be very hot but processors are designed to tolerate heat up to a certain temperature. If this temperature is exceeded, one of two things can happen. If the BIOS has the correct settings the computer will shut down to prevent the CPU burning out. If no safety setting is in place the computer will usually restart randomly. If this happens to your computer it’s a good indication that the cooling fan is either broken of blocked up with dust to a point where it can’t do its job any longer. This will need immediate attention to rectify the problem as your CPU needs to be adequately cooled or it won’t last long.